I, A Kickstarter Sceptic, Pledged To Mai Mai Miracle And You Should Too | Tsundere Britannica - UK Anime/Game News and Features! In the last few years, the Kickstarter crowd funding website has really exploded in popularity – as someone who is heavily involved in the gaming industry, I have seen this help increase the rapid expansion of the indie game genre and heck, even launch a console. However, I had yet to pledge a single penny to a Kickstarter campaign for a multitude of reasons, with the majority of them falling into the sceptical, stubborn old man box. To put it bluntly, I didn’t have faith in pledging money to people I don’t know for a product that may never actually come into existence or I may not even like in the end. Yesterday however, I pledged $55 towards Anime Limited’s Kickstarter campaign for a US/UK release of Studio Madhouse’s Mai Mai Miracle anime movie, I have admittedly never seen this movie, that even Anime Limited acknowledge as niche, so what exactly was it that made me relax my usual Kickstarter-sceptic ways? The first reasoning may sound a little bias, but it was because the Kickstarter was by Anime Limited – a company who despite only entering the market fairly recently (although its members have been around for longer), they have become renowned for their excellent taste in licensing (including classics such as Cowboy Bebop and Perfect Blue, as well as more modern gems like the works of Makoto Shinkai and Tiger & Bunny: The Beginning). As well as the quality of licenses, they have also shown to be deeply interested in giving fans the best quality product they can afford, so even without having seen the film yet, I knew I would be backing a quality product. Last year was also the first time I had attended a single convention, making my debut at May’s London MCM Comic Con. Despite being pestered by friends for years, my intense social anxiety meant that it was too much of a daunting task, but after a positive series of CBT (Cognitive Behavioural Therapy) sessions a few months prior, I felt that I was finally ready. I had listened to the representatives from the various companies on podcasts and the like before, but I made it a challenge to try and speak to all of them directly. I was casually walking in the venue when I noticed Andrew Partridge walking a few metres ahead of me. I called out to him and surprisingly, not only did he turn around, but he was actually willing to have quite a lengthy conversation with me! As with the many conversations he’s had online while visiting forums, he was incredibly honest and open about well, pretty much everything he could be – so it was only natural to trust him and everyone else at Anime Limited, who have expressed nothing but the utmost passion for this project – heck, when they noticed that the US rights were still available, they picked them up so that Americans can have a chance of seeing this movie too! In fact, the main reason I actually decided to start up this blog in the first place was because everyone I spoke to at MCM, be they from Manga UK, MVM or Anime Limited, they were all incredibly nice, approachable and friendly – which left me at a peak of happiness that I don’t think has been met since. Obviously, the proof is in the pudding but dayum does the recipe look good. I had no reason to doubt Anime Limited, but really drew me to support this campaign was how much Anime Limited have already invested – them already paying the licensing fees and only asking us to help support the physical release shows me just how dedicated they are to releasing this movie. In the past we’ve seen Kickstarters come up to fund entire projects from the ground-up, or in the case of anime, actually pay for the license (and the results of those ones are rather infamous). The knowledge that the rights to the movie have already been licensed shows just how serious Anime Limited are about this campaign. They have also provided a detailed breakdown of exactly how the original $30,000 goal (which was met this morning) will go – 50% towards the production of the release, 40% for the KickStarter Backer extras and any other extras, while the remaining 10% goes to Kickstarter. What is really cool though is that backers will have a say in what goes into the final product, through a process called “Crowd Producing” – basically, if the goal is reached (like it was in less than twenty four hours), backers will have a say in where additional money should go. One obvious choice is the production of an English dub (which has been estimated to cost a further $30,000). This concept is very interesting and one I whole-heartedly support. Shinko, is a third grade elementary school student with a magically active imagination. She spends a lot of her time listening to her grandfather’s history lessons, imagining what her town was like 1,000 years earlier. One day, a sad and sombre girl called Kiiko transfers to Shinko’s school from Tokyo. A strong friendship soon grows between the two girls as Shinko helps Kiiko come out of her shell and deal with her loss – all thanks to their adventures, both imagined and real. I think the film looks absolutely gorgeous – as expected of Madhouse to be honest. The story also sounds really sweet and charming, so it’s definitely one that has grabbed my interest. Backing as little as $25 will earn you a digital copy of the movie, with $55 ensuring a physical copy as a backer reward. If you would like to back this project, please head over to the Kickstarter now! 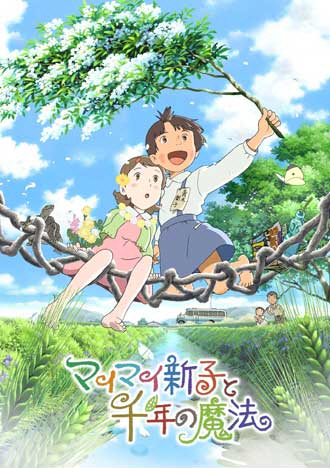 This entry was posted in Anime, Features and tagged All The Anime, Andrew Partridge, Anime Limited, Kickstarter, Mai Mai Miracle, Sunao Katabuchi.